This ATC was made for our Open House Triptych swap at North Coast Art Swaps. I used old sheet music paints, and inks collaged over scrapbook paper for the background. 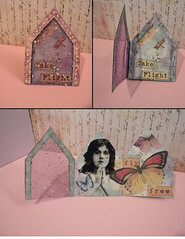 The image of the girl is a gel medium transfer, and the words and butterflies were added to finish the collage.